When you don’t want to swipe! You can unlock your door, open a gate, or even your garage door using your Smartphone. 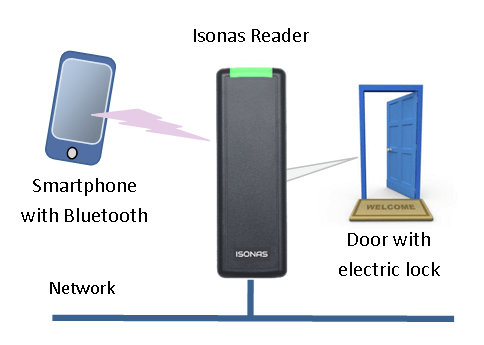 Just add the Bluetooth enabled Isonas reader. The Bluetooth reader is very easy to install. These are short range units that allows you to unlock your door as you walk near it (using an app). Bluetooth® Low Energy (BLE) allows you to use your smart phone as your credential. Add IP Cameras to create a complete security system. Please check the latest technology for enhancing and upgrading your network and computer systems: CD, DVD, Blu-ray Jukeboxes, Network Attached IP camera systems, PA and Intercoms over IP and more.